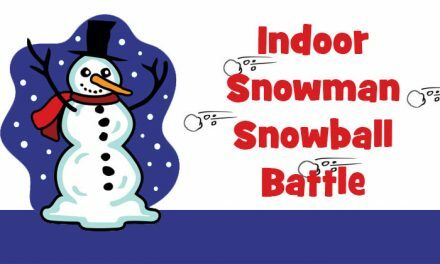 It’s the Holiday Season when friends, family, schools and offices offer lots of Christmas activities, but sometimes you need just a few minutes of time to yourself and the kids need a fun word challenge. 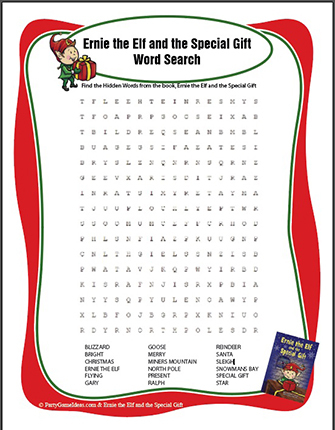 Well our Free Christmas Word Searches is a great way to keep kids and adults entertained and busy for a little while. 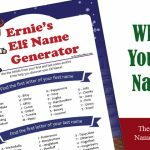 Party Game Ideas made a Ernie the Elf and the Special Gift Word Search as our Holiday gift for you! 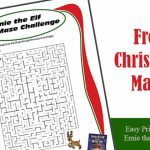 Our free printable Christmas word search contains 18 words and phrases that relate to the Ernie the Elf and the Special Gift book and they can be found up, down, diagonal, forward and backwards. 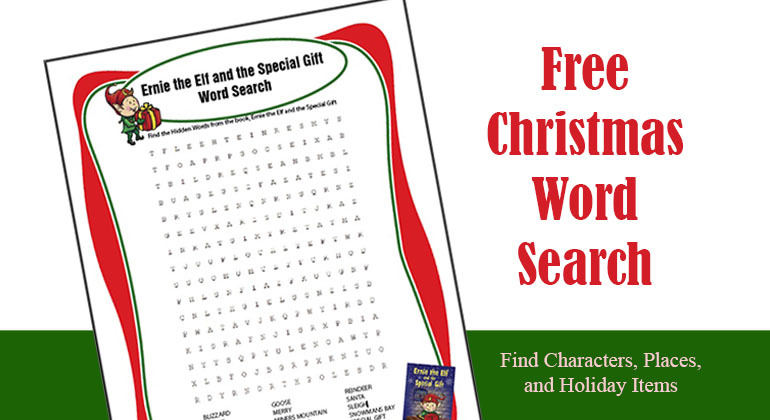 Just open the free Christmas Word Search pdf, print and you are ready to play. Print in color or black ink. 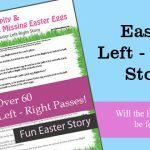 Check out Ernie the Elf’s book, games and merchandise! a. 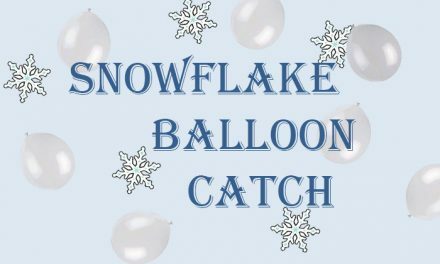 Individual Play – Hand out game sheets, first person to find all 18 Christmas words and phrases wins. 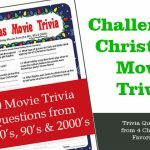 b. Christmas Word Search Relay – Group Play – Divide guests into teams. 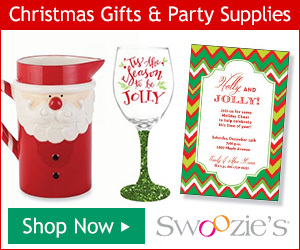 Establish a start line and a desk or table where the word and a pencil/pen is located. The team lines up at the start line and the first person from the team goes from the start line to the desk and they sit down to find one of the Christmas words in the word search. When they find the first word they circle it, cross a line through it and head back to the start line where they tag the next player. 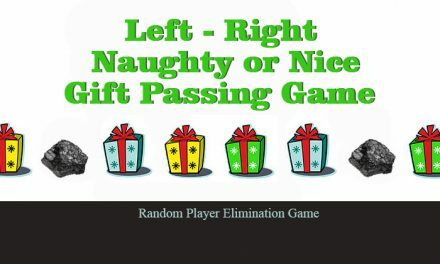 The next player heads to the desk to find another Christmas word and once they do, they circle it, cross a line through it and return to the starting line to tag the next player. 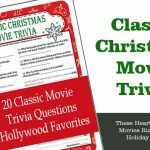 Play continues until the first team FINDS all the Christmas words and phrases in the word search. FYI with 18 words this could take 15 – 20 minutes. Speed things up by having players, find two words per turn. 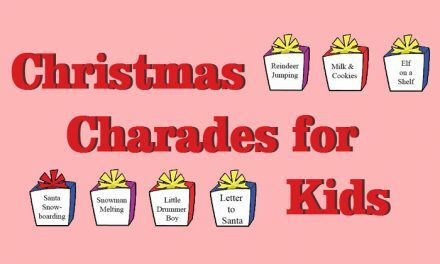 Thanks for your interest in Party Game Ideas free printable Christmas Word Search and Happy Holidays.